Immunotherapies are on the horizon to help the estimated 10 percent of horses worldwide who suffer from insect bite hypersensitivity (IBH). The condition, commonly known as sweet itch or summer eczema, is one of the most frustrating skin diseases in the equine industry, says Amanda Adams, an associate professor with the Maxwell H. Gluck Equine Research Center at the University of Kentucky. IBH is an allergic, recurrent, seasonal dermatitis caused when the immune system overacts or becomes “hypersensitive” to allergens in the saliva primarily of biting midges (Culicoides) and other biting insects. Adams, who has a particular research interest in the immune system of ageing horses, says although there is no cure for IBH, there is ongoing research to assess immunotherapies as future treatment options. It is acknowledged, she says, that the immune system plays a role in its development. Adams, writing in the latest issue of Equine Disease Quarterly, says immunotherapy treatment is based on a century-old concept that the immune system can be desensitized to specific allergens that trigger hypersensitivity reactions. Allergen immunotherapy (AIT) involves inoculation with gradually increasing doses of an allergen to which the individual is allergic. The gradual increases in exposure to the allergen cause the immune system to become less sensitive to the substance, which reduces allergy signs when the substance is encountered in the future. However, there are conflicting reports in the scientific literature over whether traditional AIT therapies are successful in treating IBH. “Research is now exploring whether IBH can be prevented by vaccination with recombinant Culicoides antigens versus whole antigen preparations to more successfully modulate the immune response, in particular, IgE response. A new allergen-independent vaccine has also been evaluated that targets cytokine IL-5 and limits the recruitment of eosinophils (a type of disease-fighting white blood cells) to the affected skin. “This is one of the few equine studies to investigate whether a vaccine can induce autoantibodies to cytokine IL-5 and result in clinical efficacy for IBH. The pony in the picture shows typical signs of sweet itch. In severe cases such as this, the scabs and sores extend all the way down the mane along the back to the base of the tail and are also seen on the flanks, belly and legs. Inset is a photograph of a typical response that occurs following an injection of Midge proteins. Dr Susan White, in a related report, provides an overview of current diagnostic and management practices to combat signs of IBH. White, from the College of Veterinary Medicine at the University of Georgia, says a large percentage of horses affected with seasonal itchy dermatitis are hypersensitive (allergic) to the bites of insects. Culicoides spp (gnats), black flies, stable flies, and horn flies are the most commonly implicated insects, although any biting insect may contribute to insect-bite-induced hypersensitivity. IBH is characterized by intense itching that often leads to abrasive skin damage, extensive hair loss, secondary infections, and thickened skin. Many horses develop IBH in middle age or later, although horses with a tendency to develop allergic diseases may exhibit clinical signs as early as a year old. Clinical signs often progress in each subsequent year. Diagnosis is made from the signalment, history, clinical signs, and ruling out of other possible diagnoses. Since there is still much to be learned about the identification and feeding habits of many insects behind allergic dermatitis, it may not be possible to identify the exact causative agent(s). In all cases of itchy dermatitis, efforts to decrease exposure to exciting agents as well as symptomatic therapy to reduce the itching are warranted. In IBH, it is important to decrease insect exposure, she says. “Farm sanitation to compost manure properly, eliminate wet areas with decomposing vegetation, and the use of fly predators or feed through fly inhibitors can greatly reduce fly populations. “Heat, humidity, and solar radiation exacerbate pruritus (itchiness), thus the provision of shade and wind currents by fans provide relief. “Stabling to avoid the most significant insects and the use of fly sheets and face masks are helpful,” she adds. 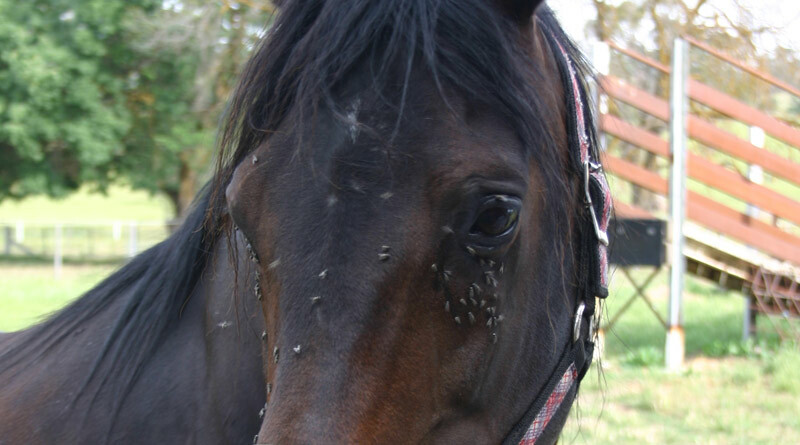 Because some horses develop contact allergies to products applied to their skin, cautious use of fly repellents is advisable. White says simple feeds and whole grains are better than mixed, multiple-grain sweet feeds. “Cool-water rinses and shampoos can rehydrate and sooth dry skin as well as reduce the amount of allergens on the skin. “Colloidal oatmeal, pramoxine, and 1 percent hydrocortisone shampoos or leave-on hydrocortisone rinses may reduce pruritus and minimize or reduce the amount of systemic antipruritic medication needed. A complete and detailed investigation into the trigger of the disease should occur simultaneously, with general treatment. Skin testing to determine antigens for allergen-specific immunotherapy may be helpful, particularly in young animals with allergy-related problems. “Clients should understand that hypersensitivities and atopy are lifelong,” she warns. “Affected horses will need continuous management and/or therapy. Often a patient may be symptom-free with low exposure to inciting antigens and symptomatic as the antigen load increases.